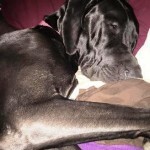 Meet Elvis - Rocky Mountain Great Dane Rescue, Inc.
Hey there, I’m Elvis! I’m a 1 ½ year old black male Dane with natural ears. My doggy housemate and I have started not seeing eye-to-eye, so I’m looking for a new place to call home. I’m good with other dogs outside the house. I’m also good with kids, though I haven’t spent any time around really little kids – my human brother is 13 years old. I’ve never been around cats, so I’m not so sure about them. I know all of my basic commands and am housebroken. I’m also crate trained and trustworthy with free roam. I’m a great walking buddy and do well on a leash with a gentle leader. I think that about sums up the big things, but we’ll have to get together to see if we are truly meant to be a family!